I am most grateful to the MEBO User Experience and Technology Director, Jason, for donating his expertise in the revamping of the MEBO website to give it a beautiful, clean, and modern new look! We now have a new and upgraded form, structure, and appearance to our website. Using Jason's words, he tells us, "The main reasons I did it are to work with the new social sharing tech, make it more readable on mobile, and bring up its Google score. Also it now has Wordpress so it'll be so much easier to update, you can make a page within minutes." What a great asset Jason and his work are for our cause. Jason took the initiative of offering to volunteer his services yet again, as he has done through the years. 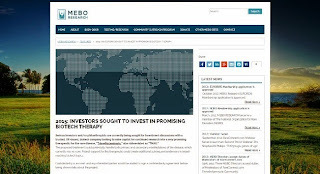 It is through his dedication and expertise that MEBO has been successful in "spreading the word" around the world. His technical support in all of MEBO's Annual Conferences has been invaluable to our community. We thank you, Jason!